March 26, 2019 This post may contain affiliate links. YAY!!! It’s finally here… Once a Month Meals is opening up for new members and that means now is your chance to finally conquer the daily “What’s for dinner?” question!! FREE Mini Menu Freezer plan to test out the site and see all the resources it offers! Open enrollment runs from April 1-4, 2019. You must purchase before the end of day on April 4th! One of the most intimidating parts of meal prep is coming up with an easy freezer meals plan to get you jump started. It’s so enticing to have a freezer full of meals to just pull out on busy nights, but the planning stage where you pull it all together is what trips most people up! I get it. I’m the type of personality that wants to jump right in and not worry about any of the prep work too! That’s actually the biggest reason why I keep shouting the praises of Once a Month Meals. And I should probably back up a bit and say… I’m fairly decent at recipe creation, planning and implementing. It’s not really something I struggle with in the grand scheme of “All Life Seems to Hand Me as I Try to Raise a Family”. But even as someone who enjoys being in the kitchen and cooking for my family, I’m still realistic. I know I still have days where we’re busy with the kids’ activities, or I have later afternoon appointments or just any of the junk that life throws at you. I can be a person who enjoys cooking and still have nights where I appreciate a freezer meal that’s practically ready to go! You know what else appreciates it?? My wallet! If you’ve never tried make ahead meals before, you will be amazed at how much money it can save you. It’s actually probably the #1 comment I get from people who read my main freezer meal post. They’re always amazed at how affordable freezer meals are and how efficient it makes them feel! 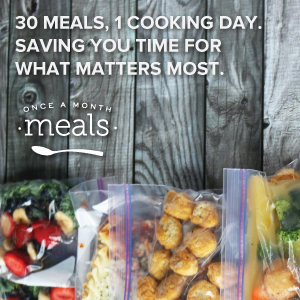 And speaking of efficiency… nothing beats joining Once a Month Meals to help make you feel like you’re on top of your kitchen game! You’re only regret will be not joining sooner. Because here’s the thing… we all know you can find recipes on Pinterest and Google. They’re free and they’re readily available. But you know what else they are? They’re scattered over different sites and it takes time to piece them all together. They’re also just the recipes. There are usually no shopping lists, no printable labels provided, no prep instructions provided for as you gather your ingredients and on and on. All things that take time. And the older I get, the more I realize that the phrase “time is money is” a cliche for a reason. It’s true! But no one likes to buy something before trying it out first right?! Lucky for you, Once a Month Meals is letting you do just that. They put together a mini menu with recipes from yours truly that are FREE! It’s true! 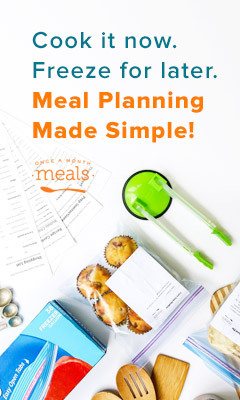 Just hop over to Once a Month Meals and you can have them email you 5 freezer-friendly recipes plus shopping lists, recipe cards, prep lists and more! It’s a great way to check it out and see if you like the format to decide if you want to check out more of the recipes! If you do decide to join Once a Month Meals be prepared for dinner time to no longer be a thing to dread! It always breaks my heart when I hear people complain about dinner time and all that it entails. It really can be something to look forward to! A chance for your family to sit around and catch up with each other while they enjoy delicious food! So check out my mini menu for FREE and then sign up to be an on-going member! There are only a handful of times a year that the site is open to new members, so you have to think fast when deciding if you want to join! The next open enrollment period is April 1-4, 2019! Update to the Freezer Cooking!